I’m not familiar with Hard but I heard a few samples of this album and liked it well enough to give it a go when it was offered up to review. This Hungarian band started out in 2004 but this is the group’s first work with Bjorn Lodin from Sweden on vocals. My first impressions of this band center on Lodin. On “Time Is Waiting For No One” he sounds like he’s straining but then I realized that’s just Lodin’s raspy style and I like it. When “Black Cloud” comes on he sounds like Rod Stewart (if Rod had never stopped singing rock music)! The raspy rock ‘n’ roll voice may not be suitable for all but it shouldn’t be too hard to accept for fans of AC/DC, Krokus, etc. It’s a voice that is welcomed and appropriate for this type of bluesy classic-sounding hard rock. It’s really amazing as this album goes on just how much he sounds like Rod Stewart at times… No show tunes or old standards here! 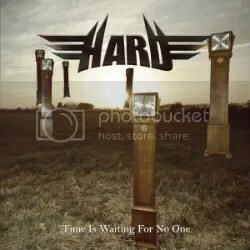 Hard has put together a collection of bluesy rock numbers with a touch of melodic rock and for the most part they do it well, if not spectacularly. The only song that falls flat with me is the ballad “Love Goes With Anything”. It’s too much AOR cheese for me. That’s not to say the band can’t do softer numbers, “The Pace and the Flow” and the album’s closer “Four-Leaf Clover” are a really good sentimental mid-tempo numbers. Rockers that sound inspired by AC/DC and/or Krokus are what Hard does best though: “Time Is Waiting for No One”, “Black Clouds” and “Into the Fire” are blistering hard rock feasts. Time Is Waiting for No One is a solid hard rock effort.